This exploration of mindfulness and adaptive yoga will begin and end with a brief discussion about the mind-body connection, mindfulness and chronic pain. This will be followed by mindful breathing awareness exercises in order to practice relaxing your body and help free your mind of worries and distractions. Mindful breathing is a vital component of adaptive yoga and navigating chronic pain for possible tension release. The session will proceed through a series of simple yoga postures based from your choice of using a yoga mat or a chair. Adaptive” yoga forms will be offered with various options and modifications to accommodate your individual ability, strength, flexibility and pain experience. For example, most people with multiple sclerosis can participate in yoga on a chair rather than the floor. 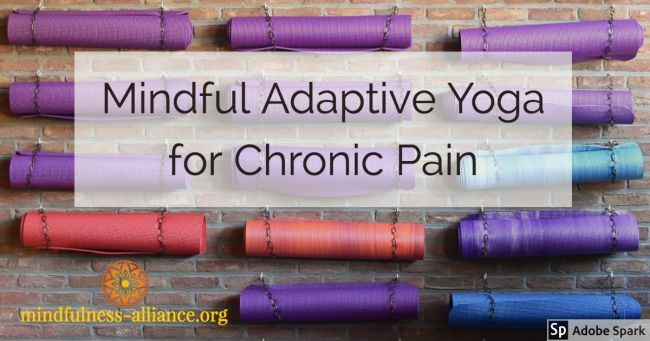 Your instructor will contact you before the workshop to make sure this mindful adaptive yoga workshop is the best fit for your chronic pain and answer any questions you might have. During this workshop it is useful to listen to your body so that you do not push your body further than it should move. Please be aware that you are always welcome to stop or modify movements at any time within this session. It is also highly advised that you contact your health provider to find out whether adaptive yoga might be an appropriate experience for you, especially if you have been experiencing medical problems, recent surgery, highly restricted mobility or working with a physical therapist or a psychotherapist/counselor. Once you’ve purchased your pass(es) use our calendar to register for the date(s) you wish to attend.